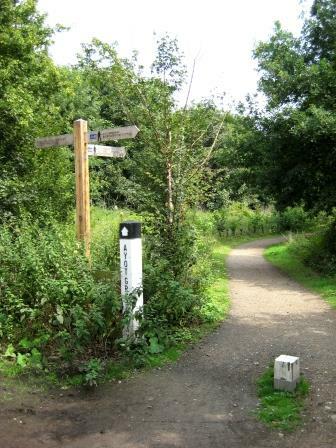 The Ayot Greenway follows part of the old railway line that ran from Hatfield to Dunstable and Leighton Buzzard. Opened in 1860, the line was closed to passenger traffic in 1965 and to freight in 1967, though rubbish continued to be taken from London to Blackbridge Tip until 1971. Nearby stations included Ayot (opened as Ayot St Peter in 1877, burned down in 1948, closed to passengers in 1949 and closed completely in 1963) and Wheathampstead (opened 1860, closed 1965), where the platform has been restored. It is hoped that the Greenway will eventually form part of Sustrans network of nationwide traffic-free cycleways. It will complete Route 57 connecting Cricklade in Wiltshire to Welwyn Garden City. Travelling from Welwyn Garden City the cycleway ends at Sheepcote Lane but can be picked up again in Leasey Bridge Lane heading into Harpenden where it again follows the old railway line to Luton. For more information see the Sustrans web site.